The 56 metre motor yacht called ‘ 56m Benetti (2007)’, jointly listed for sale by Matt Albert at Yachting Partners International and Fraser Yachts, has had a €1,500,000 price reduction. Built in steel and aluminium by Italian yard Benetti to a design by Stefano Natucci, she was delivered in 2007 as one of the yard's 56m series. Her main deck is vast, with a large shaded aft deck welcoming guests aboard before entering the formal main saloon. Substantial headroom and her formal styling give guests an immediate impression of grandeur, yet allow space to relax, whether it be by the well-equipped bar for cocktails next to the grand piano, or to stretch out in the comfort of the sofas in front of a good movie. The formal dining area is located at the forward end of the saloon and accommodates up to 12 guests. The main atrium of this yacht for sale features a spiral staircase through all decks with a central glass elevator running up through the vessel from the lower guest cabins up to the bridge deck. Accommodation is for 12 guests in six staterooms including a split level master suite on the main deck with huge windows, a VIP suite on the bridge deck with panoramic views and two doubles and two twins with Pullman berths below deck. All cabins have full en suite amenities. YPI broker Matt Albert comments: “For a 56 metre, she offers a huge amount of deck and interior space for her owner and guests. She has an immense main saloon and main dining area and also a spacious full beam sky lounge on the upper deck. 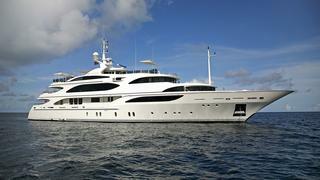 Lying in Athens, Greece, the yacht for sale ‘56m Benetti (2007)’ is down to €23.5 million.